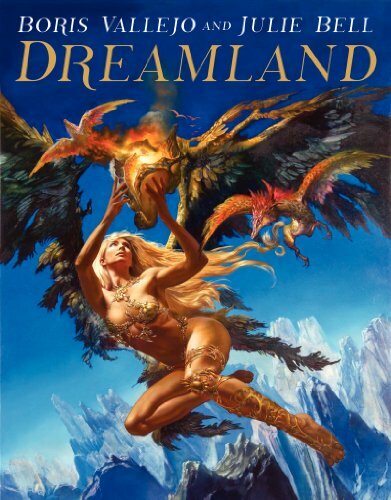 Dreamland presents a stunning collection of new artworks from the fantasy art masters Boris Vallejo and Julie Bell. They are among the best painters and fantasy artists around, and after looking at the book, it just seems that they keep getting better and better. The A4 size 192-page hardcover artbook is filled with more than 150 paintings, mostly printed one on each page with a few over two pages. Most paintings are in portrait format and fit nicely within the page. The paintings are absolutely beautiful. The collection features their personal as well as commercial works. There are individual pieces and also those that they painted together. The subject matter is what they paint best, mostly character based. Muscular heroes and heroines in fantasy lands, with dragons or mythical creatures. There are also some commissioned work they painted for advertising. The amount of detail in their work is amazing. The lighting scheme reminds me of old masters paintings and it is indeed mentioned in the book that they use techniques from old masters for their artworks, and when it comes to using human models for reference. The book includes brief autobiographies, common questions they received, hints and tips on painting, how they work together, and commentary for selected pieces of paintings. Right at the end is an envelope with 10 art prints featuring selected artworks. Very nice but the paper quality is that of the book which is not too bad, the low gloss type. This is a fantastic artbook. The only downside is that this artbook is not larger, like A3 size. I would love to look at the paintings huge and up close.